I’m always surprised by the condition of many private party market used pianos, as if a double standard is operating when comparing a house sale to a piano sale. I will sometimes walk into a home that is on the market that is clean and sparkling while the offered musical instrument is dusty, out of tune, and often missing a bench. I always watch myself delivering a lecture to a seller about the value of tuning a piano regularly–how it maintains the tension of the strings, and is part of over-all instrument care. Inevitably, I will get perplexed and vacant stares. One would think that sellers would understand the value of tune-ups as they relate to cars. Why not transfer that awareness to pianos? They would surely not market their house without making sure the A/C was in tip top shape and ready to go–same for any appliances like the stove or fridge. How about the plumbing, heater, etc. All would be well maintained, hopefully, and thoroughly checked out before a new home buyer took ownership. Sadly, time and again, the piano is treated differently, like a pariah that’s frequently shuttled off to the garage where it is shown to interested buyers. 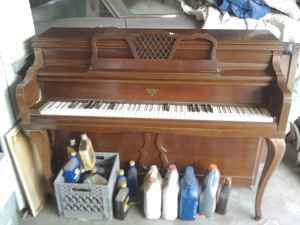 I find it particularly pathetic to find a piano photographed in the garage with bottled paint thinners/ chemicals in front of it, such as one I encountered recently. It’s not only repelling, but I can only imagine the cost to the instrument. On one occasion, I visited one such garage space during two weeks of continuous rain in the Central Valley, and the piano (formerly, a viable Kawai) had literally become drenched with water. A technician who accompanied me, recommended installing a damp chaser which he monitored for one week. 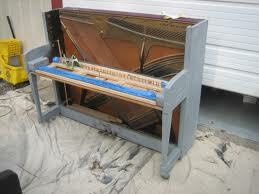 Now why would this orphaned piano of former value, have been so abused? As a piano finder, having a side-line hobby that assists my students, I circulate through many homes in poor and affluent areas of town, and despite economic disparities, a good percentage of piano sellers don’t think much about how their piano is presented. Hopefully, with education and enlightenment, sellers in the private party marketplace will let their pianos enjoy a renaissance of care and repair. Can you imagine playing in people’s homes for money (providing background music for dinner parties etc.) and encountering sticking keys, pedal issues, badly tuned pianos and the like? I was once astonished by a friend who not only did NOT play, but used her old piano as a piece of display furniture to hold up heavy objects d’art. The piano was downright honky-tonk and she couldn’t even hear how badly out of tune it was. She wanted to hear “Moonlight Sonata” – NO WAY! Yes, I can more than imagine that scenario. I’ve had a number of memorable experiences doing the dinner party circuit, getting trapped in notes, and having the hostess’s dog turn up under the pedal. In another instance, there were chipped keys with sharp edges making playing a health hazard. One woman, whom I wrote about, sold cosmetics and displayed them on top of the piano. The instrument was placed by the fireplace. That was the antique with missing pedals. I find that if a beat up piano is in good relative pitch (albeit out of tune) without any of the tones being haywire out of tune, then that piano most likely will hold a new tuning. There are other criteria, of course for selecting a used piano but checking all the notes is the first thing I do. Thanks for sharing. I think it’s best for the prospective buyer to bring a registered piano technician to the site to test for the condition of the tuning pins, strings, hammers, hammer assembly. Judging a piano only by sound is just not enough. When a seller says, “all my piano needs is a tuning,” that could be a red flag. Many pianos will not hold a tuning and will never be able to be brought up to A 440.
what you say may be fine but im looking for a top shape console or spinnett piano for today.now of course id like a fair price which includes delivery. joe at –805-937-9020. can do??? If it were me, I would purchase this instrument..These are beautiful inside and out. Actually it’s located in Sunnyvale….